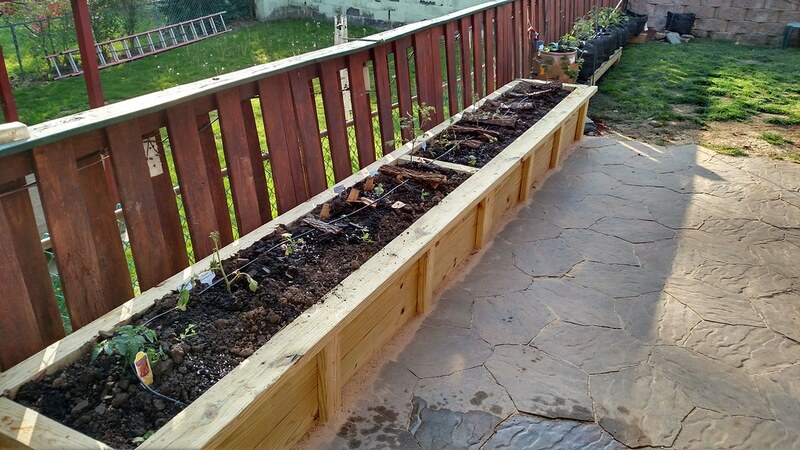 I been thinking of building a garden bed and I watched a bunch of YouTube videos of other people's build. I plan on using cedar wood for my build and going for a 4"W x8"L x12"H with 2x4 lumber. From the YouTube videos that I have watched they don't answer the bowing of wood and I would like to know if bowing occur against the 8" that I need to add a 2x4x12 post in the middle of the 8" to prevent the wood from bowing? Any inputs would be nice. The thicker the boards, the less need for bracing to prevent bowing. 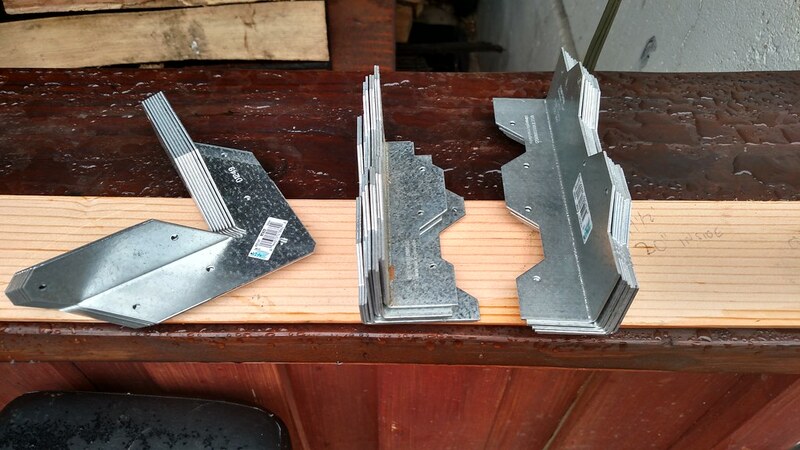 If you are using 1" boards, then I recommend bracing along the sides. If they are at least 2 inches thick, you will probably be OK, however store-bought dimensional lumber of 2 x 4 is going to be 1 1/2 x 3 1/2. 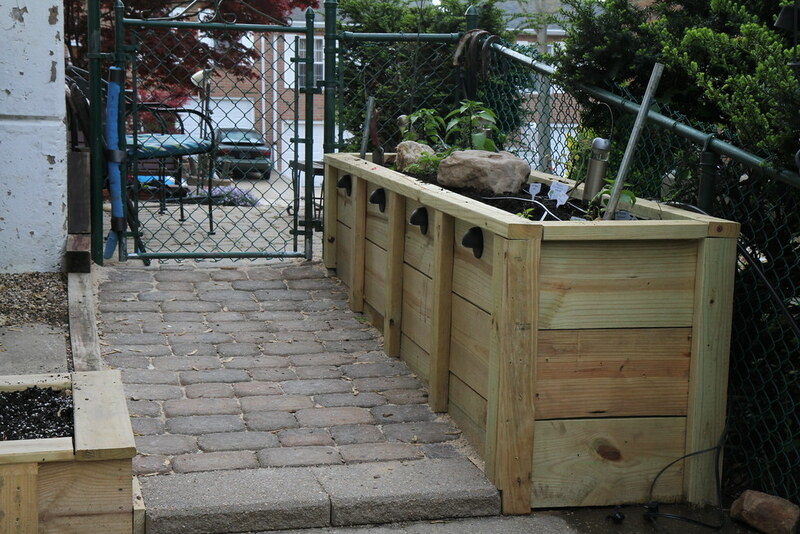 I have 4 x 8 x 12 raised beds made from Tamarack wood that is a true 2 inches thick, and I did not add any middle braces. I have had no problem with bowing. Besides the true 2 inch thickness of the boards, I believe another reason I have not had any bowing is because the soil mixture is never walked on so it doesn't get packed down, and it is rather fluffy and light...even in the Spring, I can easily dig with my hand right down to the bottom. I would recommend something like Tamarack over Cedar just because it will be cheaper. Depending on where you live, it may be harder to find, though. I got mine from a local guy who mills his own logs. Its probably not needed but I would and it depends on how you build it. Or if using dug in posts I would post each corner and the middle. You can do this on the inside or outside. I would also put in uprights to make sure your boards flush. I'll post done pics later on today. Here is one of my builds that may help. This pic shows inside supports to keep boards flush, you could put posts here in the center and dig in 24" and pack with stone. Corners and side supports offer aesthetics and structure. The top plate adds aesthetics and structure as well. Lights add a bit of a finished look. and a nice coat of stain to bring it all together, now it don't just look like a box. Moms bed was wide so I added a center support, this should be lagged in with some washers. Corner pieces add structure, just screwing the boards together the ends eventually rot and the screws pull out, if the corner pieces are put on the inside, they will rot where the ends are and the screws are quicker than if they were on the outside. this is how I was saying to do the posts, this could be on the inside or outside. 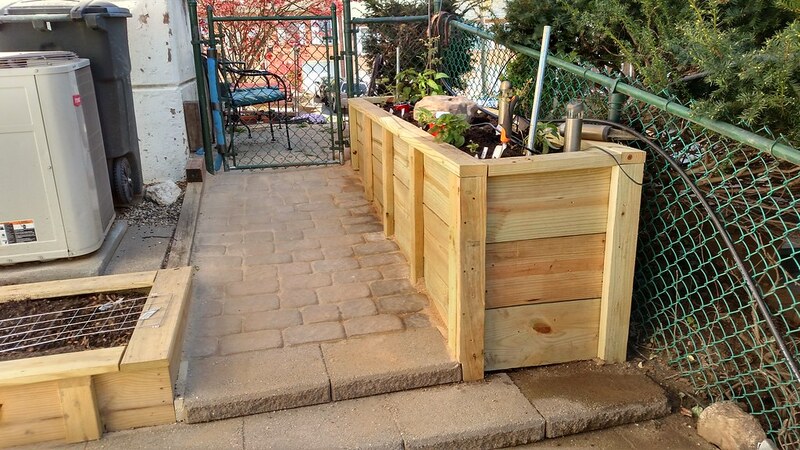 Here's a thread where I talked about (and showed) my raised beds built from stacked 4x4 pine fence posts. The fence posts are better wood and will last longer. I just did the landscape timbers because it was the cheapest option and moving in to a new house, I had a ton of things to spend money on. In any case, dimensional lumber (posts instead of board) will last a lot longer, regardless of how much you brace the boards. And stacking them and staking them with steel rebar down through the stack is a very easy build, but very solid. @MoonShadows yeah I don't think the cedar 2x4 at homedepot is really 2x4. But would you say the 1 1/2 and 3 1/2 still need a middle brace for the 3 boards? I also plan on lining the inside wall with a roll of fish pond plastic so the water is going down instead of leaking between the boards. I don't think my location has the Tamarack type of wood since I want long lasting wood that has to deal with rain and snow. I would use pressure treated but I didn't like the wood shrinkage and gaps between. @SQWIB thanks for the picture but I plan on having it 12" high or whatever the weird values of it being 11" 1/2 for the 8" 2x4 cedar at Homedepot. 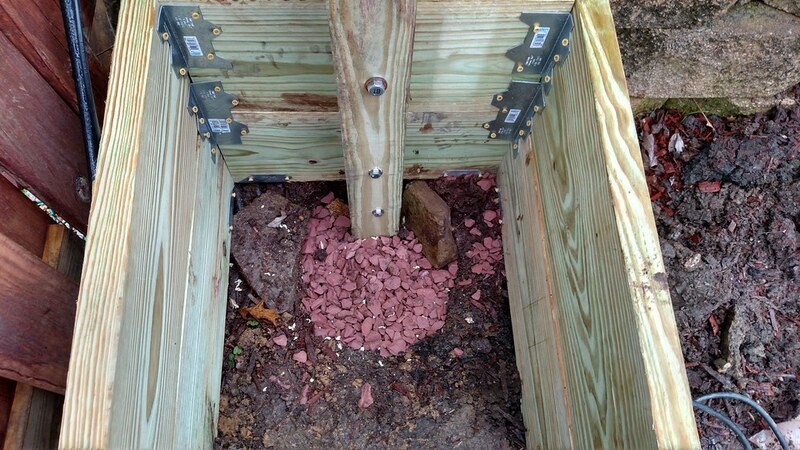 The post/corner won't be dug into the ground and would just be connected to the boards. 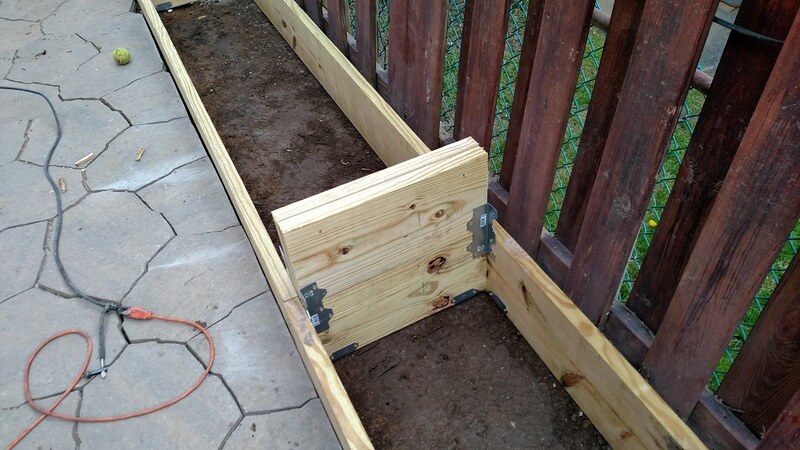 These garden bed will be placed on my existing garden that had nothing. I can level the ground evenly since it's not on a slope and I don't have to rip up area that grass grew over. 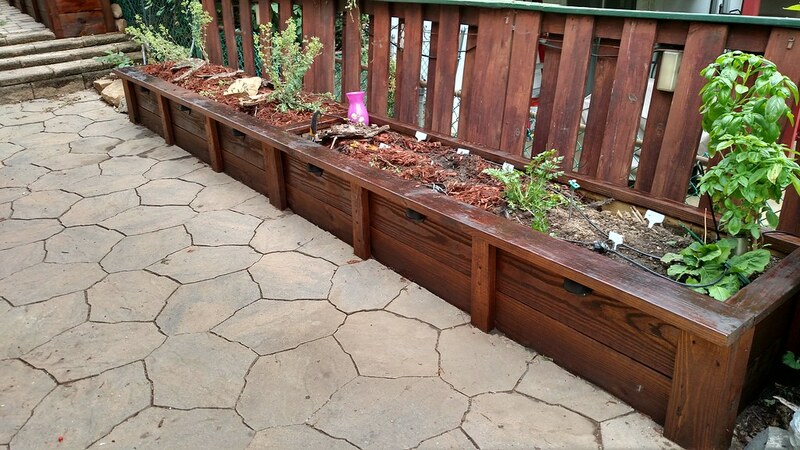 @rainbowgardener thanks for the ideas and suggestions but the location of my homedepot only carry cedar and pressure treated in the 4x4 size. I didn't like how the pressure treated wood would shrink over time and leave gaps between each other. I would like to do a 4x4 build but it's over my budget since I plan on spending about $100 build per garden bed and will have around 9-10 4x8x12 garden beds. I use pressure treated wood. I seal it with polyurethane and stain. Personally I think having slight gaps between the layers helps with drainage. You want water to be able to escape from the bed easily. If you line the sides, you better have a very loose sandy bottom with holes punched down into it, or your beds will become bathtubs. The landscape timbers are very cheap, ended up costing me $30 per bed. If you look at the first picture I linked to, the pine 4x4's, those beds were already at least seven years old when I took their picture. The gaps are still very slight. Those beds lasted about sixteen years and then the person we sold the house to, who wasn't a gardener, took them down. But they were still very solid at that point. 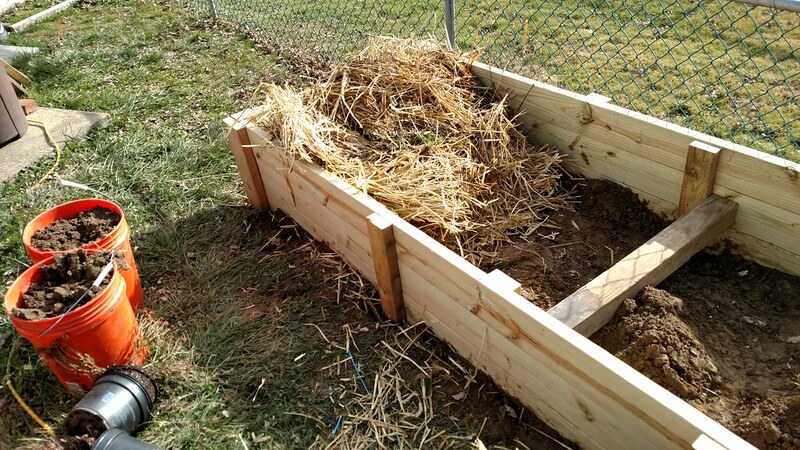 Reminds me I have a book about colonial williamsburg gardens and they did something similar as more cold frames with top covers but they sank the bottom of their raised beds deeper into the ground and filled it full of compost/manure to give off heat to extend the season significantly. 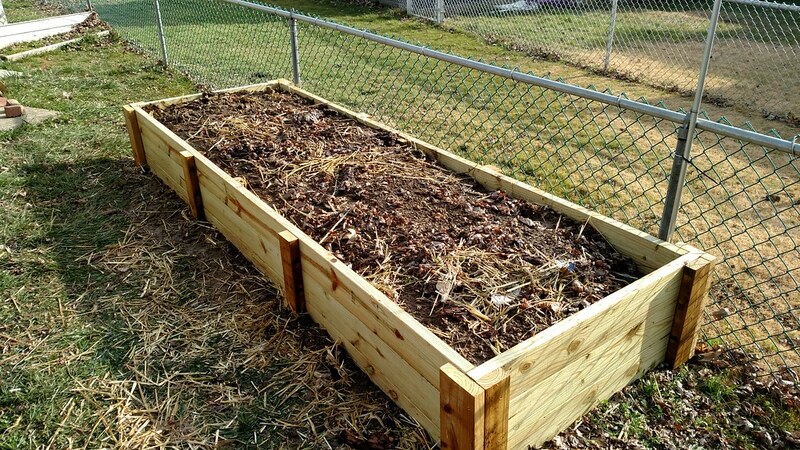 psa; I know it's too late now but in my opinion - DON'T build your own garden bed! I did it and it took ages and a lot of work/effort. The next time I wanted a garden bed I went online and bought one of these instead vegepod.com.au for the same cost, with almost zero wasted time. Yeah right. 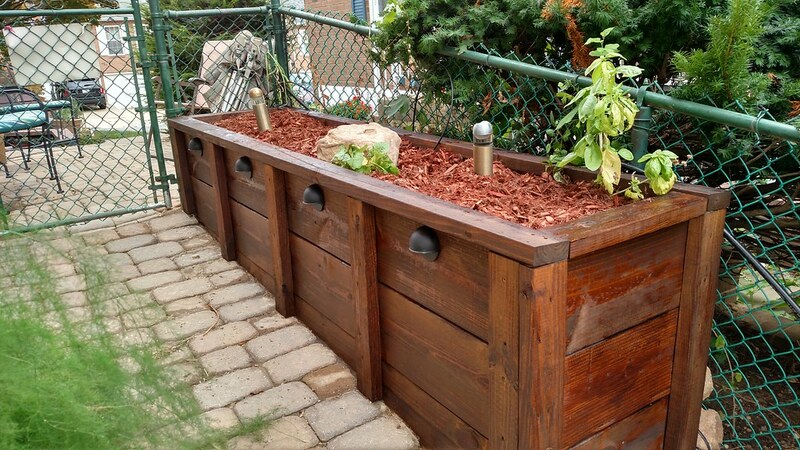 a 39" x 39" 11" deep garden bed for $239. I built my 8' x 4' bed for $30 and a couple hours labor. Very nice and aesthetic. You have carpentry skills. It would not work for me well because not only do I not have the right tools or skills ( I need to use angle braces to get a 90 degree corner), termites would make fast work out of most wood here in contact with soil. Cedar and redwood are more termite resistant but they still rot after about 15-20 years. I made my bed out of dry laid hollow tile. Very little skill required except for a shovel, rebar, tiles, a level line, and a heating pad for the aches and pains. A few tiles have been pushed out by roots but for the most part it has stayed intact. 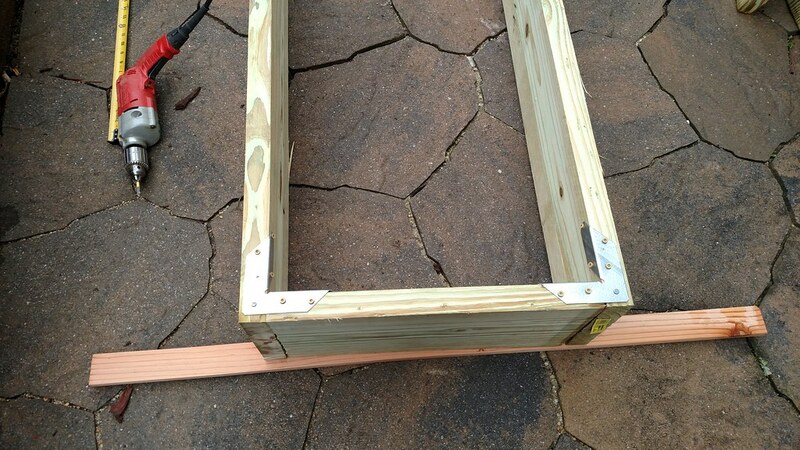 The bed frame can be as simple as 2 x 4s on top of the ground, or even patio retaining wall blocks. The size is up to you. A bed that's at least 6 inches high provides ease of access and gives roots plenty of room to grow. These instructions describe building a 4-foot by 6-foot by 10-1/2-inch bed with 2 x 4 untreated lumber. 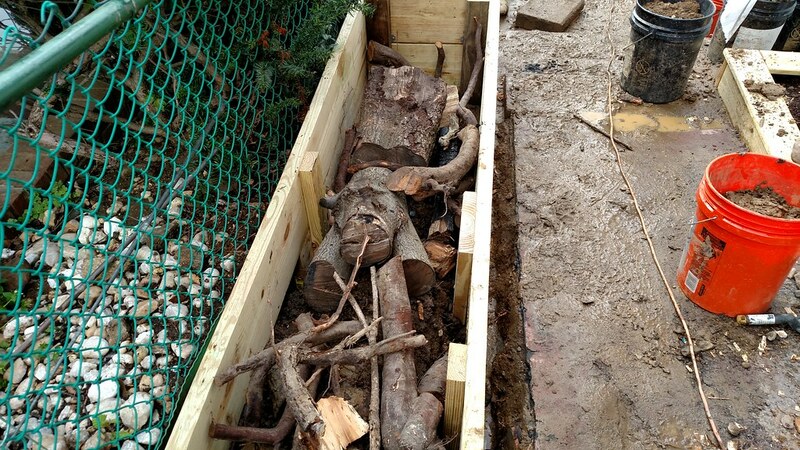 Untreated lumber isn't rot-resistant, but it's a good option for edibles. Use pressure treated wood factory guarantees it to last 20 years. You can buy 2 boards 1x6 for about the price of 1 board 2x6 twice as many boards for about the same price. Stakes along the sides keep the beds from moving and keeps the sides from bowing. 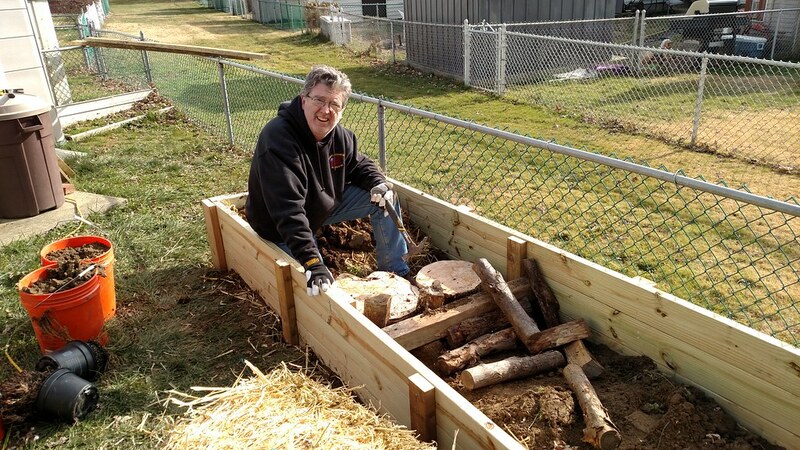 I built several raised beds in the past 40 years I would never build one taller than 6" but you do what works best for you. 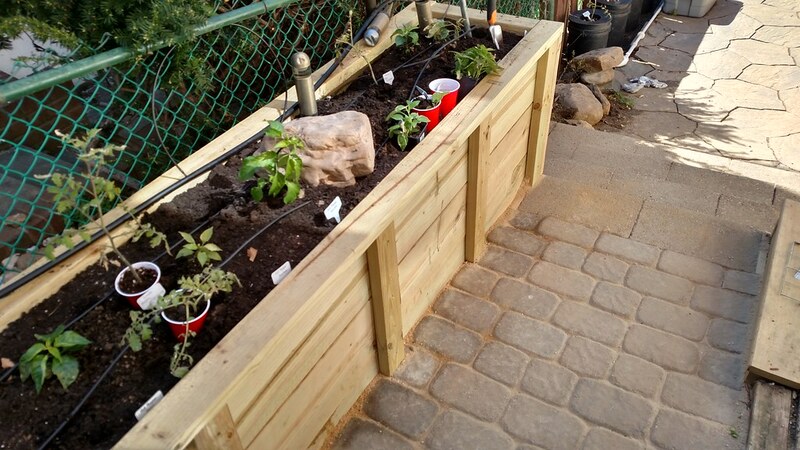 The taller a raised bed is the dryer soil gets and the more water it needs especially in hot weather. 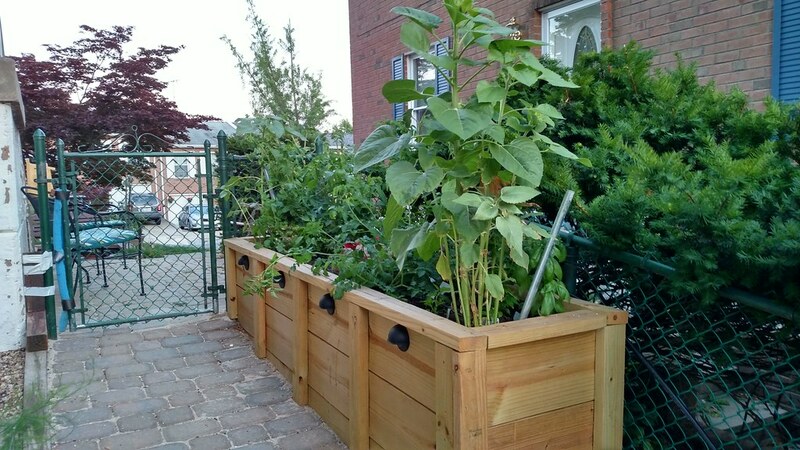 Can you build a verticle herb garden with milk crates?